What would you say to someone who told you they hated talking on the phone? They screen every call before they answer, already irritable because the sound of the phone has made them jump. What about avoiding invitations to parties and get-togethers? Or going and then hoping to blend into the scenery, reluctant to chat or make eye-contact. Would you tell them they were just shy, to get over, get out there, meet some people? Or would you stop & consider they might be socially phobic? It’s taken my husband 11 years to concede that I could be socially phobic. I think the millionth, “Why are you calling? Why can’t you text, for the love of all that’s holy?” finally got to him. He’s slowly comprehending how much my anxiety takes out of me, and the cost of ‘functioning as normal’. He’s your textbook good guy, a decent human being that would never want to see his loved ones in pain, but if it’s taken him long to ‘get’ this, how much do others suffer? My social anxiety manifests itself in interesting ways. I don’t struggle with shopping, mostly because I do it online. I’ve been known to mutter frequently, “I hate people”. I have worked from home for 5 years now, because I am safe in my own space, behind my wall of screens, connected by the internet. On the rare occasions I have to do face time with clients, I psych myself up, practice everything I need to say, plan everything down to the last detail, and lay off the caffeine. But if there is any deviation from plan A, I have plans B, C & D. Is this time-consuming and exhausting? You betcha. But it’s the only way I know how to cope, and a darn sight better than the overwhelming sense of apprehension, nausea, clammy hands and gut-churning panic attacks that I used to have. What a rush, said no sufferer, EVER. I’m the chica in the corner, on the fringe, at the edge. I’ll never be the person with my back to the door, or sitting in the middle of a restaurant. My anxiety gives me the strength to ask for a corner spot! Or it is my hyper-vigilance? I don’t discriminate in my anxiety; my husband has been on the tail end of my temper if he stands behind me for longer than 1.6 seconds. I’ve never been in active combat, so I don’t know why I am this way. 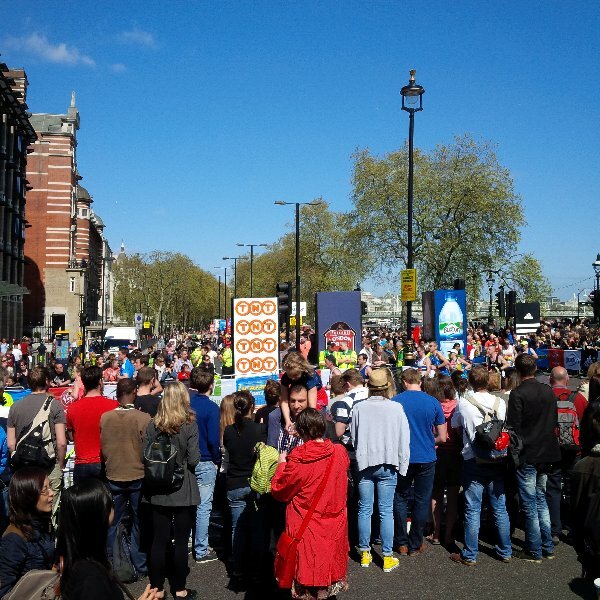 Me watching the London Marathon last year, with a safety zone of at least 3 metres one way and a concrete plinth to stand on so no one could sneak up behind me. Many psychiatrists and psychologists believe, as with many mental health conditions, social anxiety disorder is most probably the result of a combination of genetic and environmental factors. However, the exact nature of the relationship between genetics and learned behaviour is uncertain. The parenting you experience may influence whether you will develop social anxiety disorder. If you have worried or anxious parents, it can often affect your ability to cope with anxiety during childhood, adolescence and adulthood. Biologically, social anxiety disorder is currently thought to be related to abnormal functioning of brain circuits that regulate emotion and the “fight or flight” response centre. There is no cure for SAD. There is medication, which I don’t enjoy, and Cognitive Behavioural Therapy, which seems to be working slowly. I’m working on identifying unrealistic beliefs & behavioural patterns. I want to de-sensitise myself to certain triggers, and question certain gut-reactions. I want to be the person that can just say YES to adventure, to sit in the middle of a cafe and look strangers in the eye. Most of all, I want to stop planning and start living. So wishing you luck and so much more. Good luck! I’m a lot like you btw. I don’t even like doing the school run. Luckily for me, my husband drops my daughter off and then I pick her up. I hate small talk you see, can’t stand it. And it’s so annoying because my daughter’s school never ever sends them out on time. So I’m stuck there with all the other mums looking at our toes and making small talk which is actually funny because I don’t really have much to complain about because the mums I usually chat with are all nice! It’s all in my head. I know what it must take out of you to get out and do the day to day stuff, so you have my admiration. I worry about passing this on to my daughter; I don’t want her to be a nervous wreck! How much do your children notice? It’s a whole different experience when you’re trying to manage any disorder AND be a good parent. I talk to my daughter about how I’m feeling, about my triggers – edited versions that I feel she can handle. I want her to realise that everyone struggles and not all struggles are immediately visible. That’s great 🙂 I agree, it is important for kids to see that their parents are only human too! I think I tried too hard to hide my struggles from my kids in many ways…It is hard to find that balance between protecting them and letting them know things. I wouldn’t worry too much about passing it on to your kids, especially if you have an outgoing spouse or other family members. I have four kids and of the four, only one has GAD, but I think it’s genetic too… It tends to run in our family. I have an uncle who makes me look like the life of the party. Me? I have issues as well. I’m an introvert who is comfortable with her own company and I will never ever sit with my back to the door in a public place unless there is no choice. I lost a job once because they suddenly wanted me to start calling people and I refused, so I totally get you with the phone thing. I’ll email people all day long, but call them? Not on your life. I hate phones. My husband and daughter are both outgoing adventurous types. I’m hoping she stays that way. I could never do a sales job, but my husband could sell ice to penguins. I’m hoping I can get this under control so I can start enjoying life with them. Wow I could have written this myself! I’m lucky, most of my people will text or email unless it’s an emergency (play up that hearing loss to my advantage). I struggle with more than one but I think that’s because background noises seem to drown out the person talking. Puts me in b**** mode fast! I’m there with you on this. Completely. I do wonder if I overcommit myself sometimes, and then get overwhelmed. I’m getting better at saying no nicely, and choosing the things I REALLY want to do. I wish you well as you move forward with your therapy. I wonder if writing about it is therapeutic and will help as you strive to live more and plan less. Best of luck to a healthier and happier you! You sound like you are on the right track and have lots of support. PS. Maybe you can unplug that darn phone. I do a lot of the time and I don’t have an anxiety disorder. I just hate talking on the phone! I’m so glad that texting exists 🙂 I know these symptoms very well.